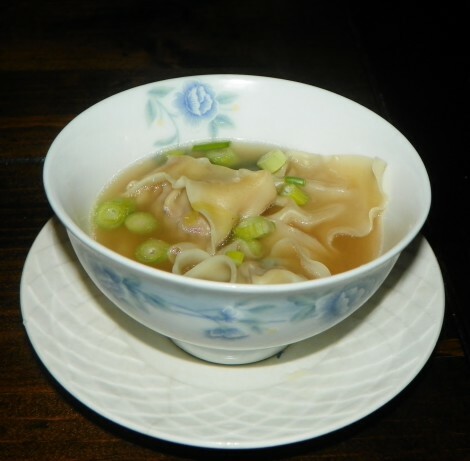 I love soups, and one of my favorites is wonton soup. In China this dish is considered a snack rather than one course of a meal. Place ingredients for soup base into a large soup pot and bring to a boil over medium heat. Once boiling, reduce heat to low, cover and simmer for 10 minutes to combine flavors. Remove broth from heat and set aside. Place 2 tbsp chicken stock and cornstarch into a large mixing bowl and stir to combine. Add minced scallions, minced ginger, pork, soy sauce, dry sherry, sesame oil, and sugar, and stir well. Fill a cup with water and set it nearby. Place a wrapper in front of you so that it looks like a diamond. Dip your finger in the water and moisten all 4 edges of the wrapper. Place about 1 tsp of the meat mixture in the center of the wrapper and fold in half over the filling to make a triangle. Press firmly along the sides to seal it and remove any excess trapped air. Moisten the left and right corners of the triangle and pinch them together. Place stuffed wonton on a wax paper lined baking sheet and cover lightly with a kitchen towel. Repeat until all wontons are made. Bring reserved broth to a boil, cover and reduce heat to medium low. Add wontons to simmering broth. Stir occasionally until wonton filling is firm and cooked through - about 5 minutes. Stir in spinach leaves and cook for 30 seconds until they wilt.